The award winning Incognito™ Lite, just like the full Incognito™ hidden braces, are fixed braces that are attached to the lingual or back surfaces of your teeth, ensuring they are hidden from view. However they are a faster and more competitively priced alternate to the full Incognito™ system as it only treats the front six to eight teeth. The braces are fully customised and are engineered to treat your orthodontic issues, as each bracket is individually made to exactly fit the shape of your teeth. They are designed to be comfortable and to perfectly conform to the shape of your teeth making them easy to wear. 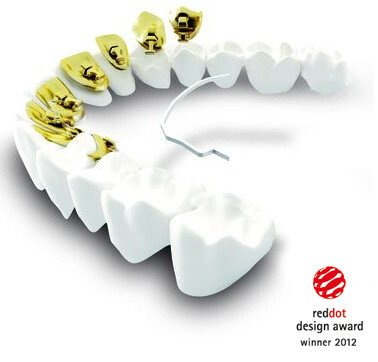 Each bracket is cast from gold and the surfaces are highly polished for your comfort. The use of gold makes this treatment ideal for anyone who has nickel allergies. For an invisible option to fully correct more complex problems, discover Incognito. Or for a fixed brace designed to correct complex problems fast, discover Damon braces.